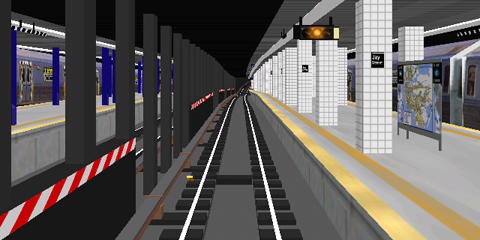 Line 2 in New York's subway (the Brooklyn line with the Flatbush branch line, part of the West Side line with the Brooklyn branch line, and finally the White Plains line, all former IRT), for the subway train class R-142 or class R-36 Redbird . 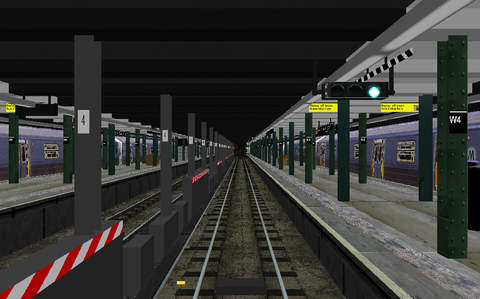 The line begins at Flatbush Avenue/Brooklyn College in Brooklyn and goes through, among other stations, Times Square/42nd Street on Manhattan, where this simulation ends, to Wakefield/241st Street in Bronx. Detailed stations. Plenty of trackside signs and signals (with correct signal numbers). Soft curves and realistic switches, and also announcements of all stations and connections. In OpenBVE there are problems with transparency in the graphics that don't work. 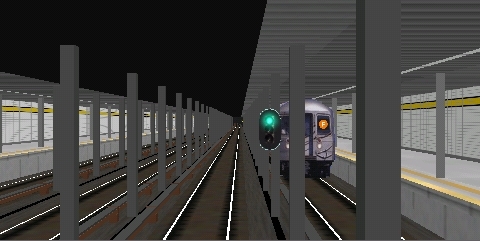 It shows as blue lines around the destination signs on the class R-62 trains that appear along the line. The problems can be fixed by changing in the definition files for those graphic objects. In the directory LegacyContent\Railway\Object\WestsideA\cars are the files r62_1.b3d , r62_3.b3d , r62_4.b3d , r62_5.b3d , r62_7.b3d and r62_9.b3d . In each of these files the word Transparent followed by three numbers appears at 6 lines. Change in each of these files so the 4 first appearances of the Transparent-instructions are Transparent 0, 0, 255 and the 2 last are Transparent 255, 0, 0. Times Square/42nd Street 9--13 min. Line 6 in New York's subway (the Pelham line and the East side line, both former IRT), for the class R-142A subway trains. This line begins at Pelham Bay Park in the Bronx and goes to Manhattan and ends at the Brooklyn Bridge station. 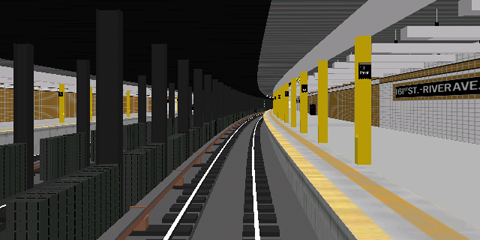 Then the empty train goes through the abandoned City Hall loop station and arrives at the northbound track at the Brooklyn Bridge station. The team behind this route provides a well-done and beautiful simulation of the highest class. 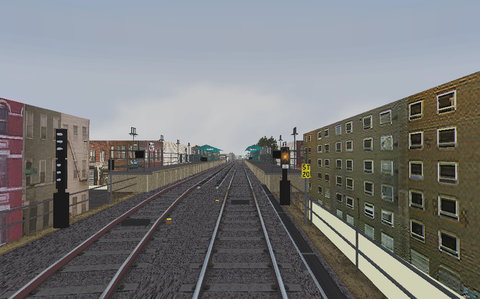 Stations, trackside objects and the urban environment are detailed. Soft curves and realistic switches, announcement of stations and connections. Everything on the Pelham line. Everything on the East side line. 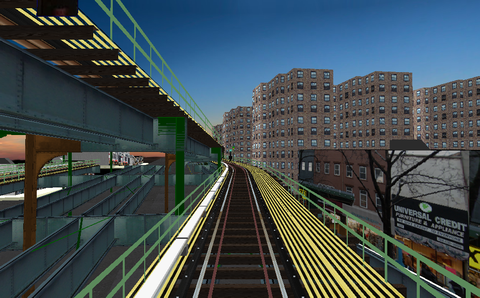 Line 7 in New York's subway (the Flushing line, former IRT), for the class R36 Redbird subway train (local) or class R62 subway train (express). The line begins with a few stations below surface on Manhattan, but most of the line is elevated going through Queens. Announcements for all stations and connecting lines. Route files with the changes mentioned in the Known problems section above done. 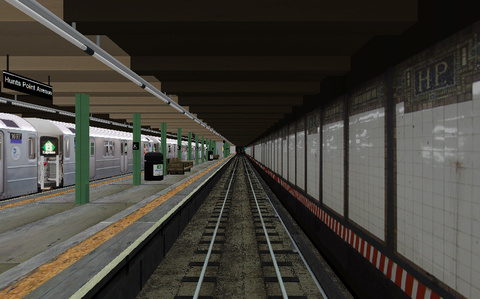 Line A in New York's subway (8th Avenue line and Fulton Street line, both former IND), for the class R46 subway trains. 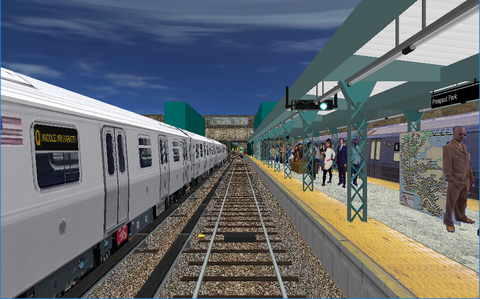 The simulated alternative of the A-line starts at 207th Street far north at Manhattan and ends in Ozone Park/Lefferts Boulevard in Queens. 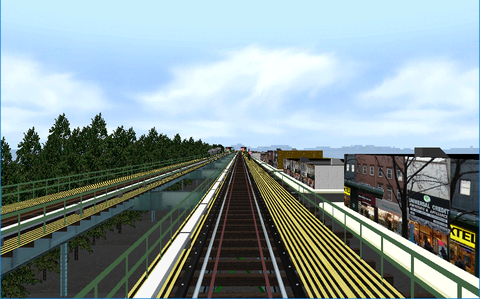 Included is also a simulation of the Lefferts Boulevard Shuttle. The shuttle line starts at Euclid Avenue in Brooklyn and goes to Ozone Park/Lefferts Boulevard in Queens. This shuttle line is only operated at night. During daytime ordinary A-line trains serve that part of the line. Detailed line, both stations and trackside! Soft curves and realistic switches, announcement of all stations and connections. Line B in New York's subway (part of the 6th Avenue line, part of the Queens Boulevard line, part of the 8th Avenue line and Concourse line, all former IND), for the class R-68 subway train. 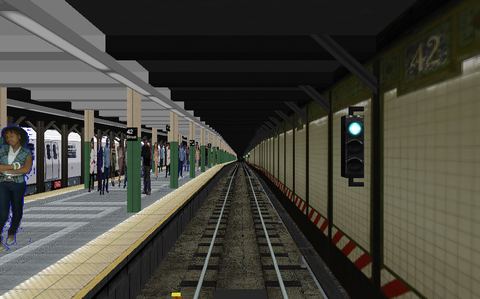 This line is entirely under surface and this rush hour alternative begins at Bedford Park Boulevard in the Bronx (ordinary hours the line starts at 145th Street at Manhattan), and goes to Grand Street at Manhattan, where this simulation ends. In the real world the line continues to Brighton Beach in Brooklyn. Detailed line, both stations and trackside. Soft curves and realistic switches, announcement of all stations and connections. 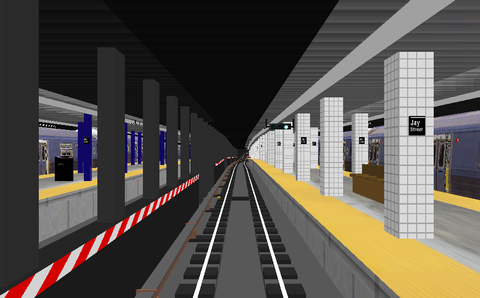 This line uses graphical objects from the NYCTA A, NYCTA C, and NYCTA D lines, which must be installed before this line can be used. The graphic object for a trailing switch at the exit of 59th Street/Columbus Circle shows the switch in the wrong position. Everything about the Concourse line. Everything about the 8th Avenue line. Everything about the Queens Boulevard linen. 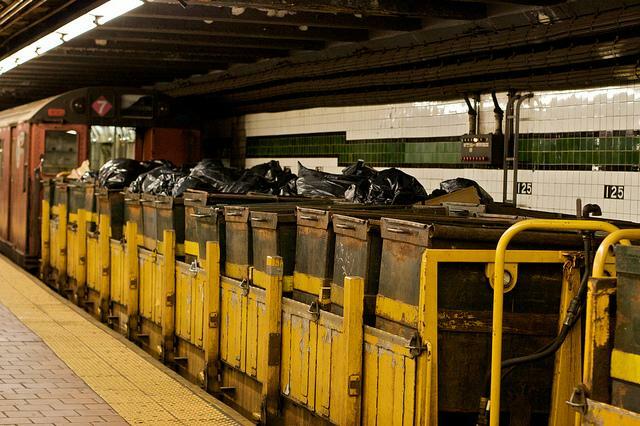 Everything about the 6th Avenue line. Line B in New York's subway (part of the 6th Avenue line, part of the Queens Boulevard line, part of the 8th Avenue line and Concourse line, all former IND), for the classes R-68 or R-160A subway trains. This line goes from Wakefield-241st Street in the Bronx and goes through Manhattan to Brighton Beach in Brooklyn. 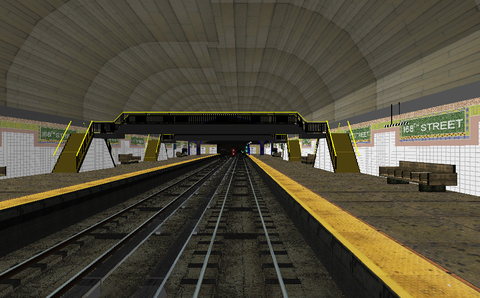 There is also an alternative from 145th Street on Manhattan to Euclid Avenue in Brooklyn. The team behind this route provides a well-done and beautiful simulation of the high class. 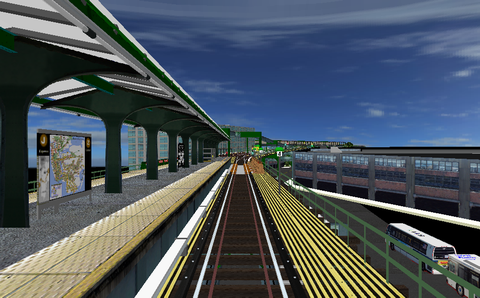 Stations, trackside objects and the urban environment is detailed. Soft curves and realistic switches, announcement of stations and connections. There are more objects to download for this line than is mentioned on the route's download page. 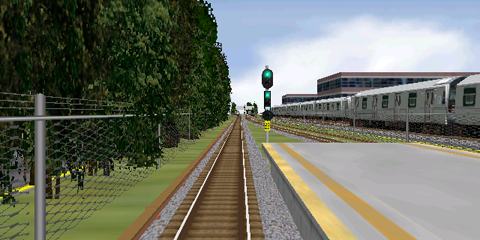 This route uses the "IND Valley Stream" object pack. It cannot be separately downloaded but is included with the newest version of F line. The LefShut object pack is also needed. It cannot be separately downloaded but is included with the A line. All archives listed in the "Download from"-section below and are needed to get this route to display the graphics properly. 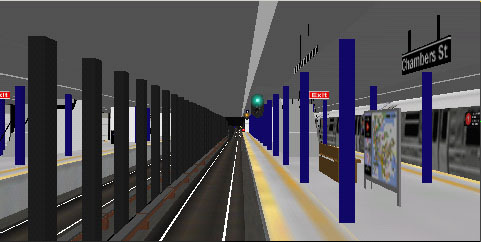 Route, sound and object files at BVEstation, 6th Avenue Object pack at BVEstation, 8th Avenue Object pack at BVEstation, Culver Object pack at BVEstation, LisaRaye2 Object pack at BVEstation, The A line at BVEstation from which the LefShut object directory is needed, The F line at BVEstation from which the IND valley stream object directory is needed. 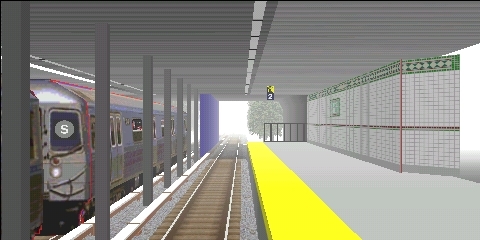 Line C in New York's subway (8th Avenue line and Fulton Street line, both former IND), for the class R32 Brightliner subway trains. 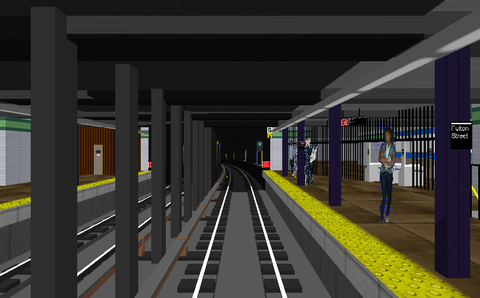 The simulated line starts at a track in the 174th Street Depot at northern Manhattan, from which the train goes to the 168th Street station at Manhattan to start revenue service. Revenue service ends at the Euclid Avenue station in Brooklyn, from which the train is moved off service to a track towards Pitkin Avenue Depot to change direction. Detailed line, both stations and trackside! Soft curves and realistic switches, announcement of all stations and connections. 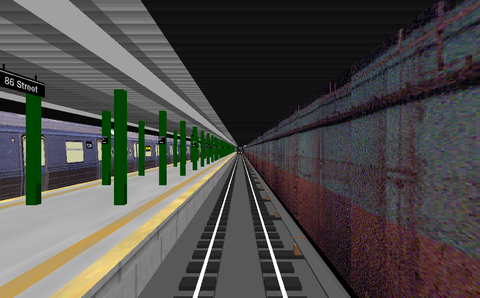 This simulation requires the NYCTA line A to be installed as it uses graphic objects from this line simulation. Line C in New York's subway (8th Avenue line and Fulton Street line, both former IND), for the class R-160A subway trains. 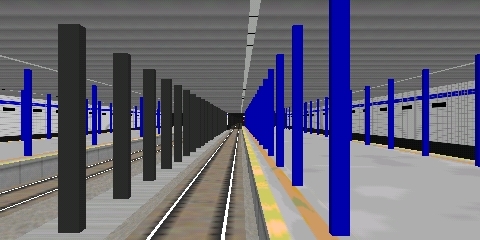 The simulated line starts at a track in the 174th Street Depot at northern Manhattan, from which the train goes to the 168th Street station at Manhattan to start revenue service. Revenue service ends at the Euclid Avenue station in Brooklyn, from which the train is moved off service to a track towards Pitkin Avenue Depot to change direction. Detailed line, both stations and trackside! Soft curves and realistic switches, announcement of all stations and connections. There are more objects to download for this line than is mentioned on the route's download page. This route uses the 6thAve and LisaRaye2 object packs. The route also uses the object directory LefShut . It cannot be separately downloaded but is included with the A line. All archives listed in the "Download from"-section below and are needed to get this route to display the graphics properly. However, there are also needs for objects that are not present in the object directory 6thAve even if it is downloaded. Also in the object directories included with the route, 8thAve and ind 8th avenue , there are objects missing. Almost all signals along the line are missing. A facing switch at the exit from station 59th Street/Columbus Circle looks like it leads to the diverting track, but the train is going on the straight track. That can be fixed by editing the route definition file, changing the graphic object representing the switch: At line 20800 there is a lot of code. Change the original file's @freeobj(0,1413,0,0,0) to @freeobj(0,1407,0,0,0) and then save the altered file and you are done. At the exit of the station Canal Street a cross-over with four switches is broken. At the exit of the station Hoyt-Schermerhorn Streets a cross-over with four switches is broken. At the exit of the station Euclid Avenue three switches are broken. At the lay-up track beyond the station Euclid Avenue a cross-over with four switches is totally missing. 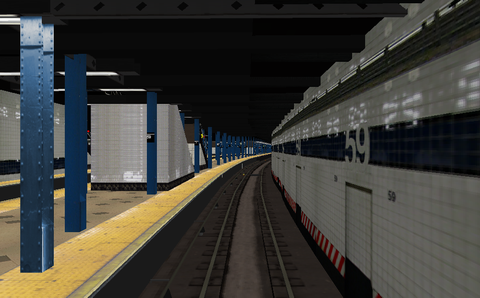 This simulation seems to be an update of an update of The NYCTBA Team's simulation, mainly changing a lot of textures to give a better look. Route and some object files at BVEstation, 6th Avenue object pack at BVEstation, LisaRaye2object pack at BVEstation, A line at BVEstation from which to get the LefShut object directory. Line E from the year of 2007 in New York's subway (the Queens Boulevard line and a part of the 8th Avenue line, both former IND), for the class R32 Brightliner subway trains. All of this line is below surface, from Jamaica Center to Chambers Street/WTC. Signals, trackside signs and different types of stations. Announcements of stations and connections for other lines. Line G in New York's subway (part of the Brooklyn/­Queens Crosstown line plus a part of the Queens Boulevard line, both former IND) for the class R46 subway train. The line starts at the station Court Square in Queens and goes to Smith/9th Street in Brooklyn (without ever going to Manhattan). Detailed line, both stations and trackside. Soft curves and realistic switches, announcement of all stations and connections. There are more objects to download for this line than are included in the route's archive file. All archives listed in the "Download from"-section below are needed to get this route to display the graphics properly. The object directory LefShut comes with the A line which also needs to be downloaded. All about the Queens Boulevard line. Route, object and sound files at BVEstation, 6th Avenue Object files at BVEstation, 8th Avenue Object files at BVEstation, The A line at BVEstation from which the LefShut object directory is needed. 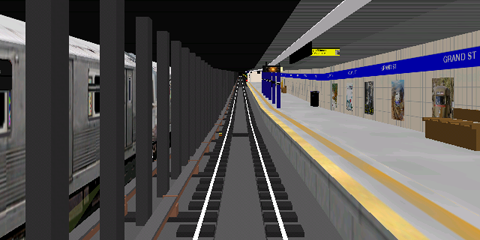 Line L in New York's subway (Canarsie line, former BMT), for the class R-143 subway train. The line goes from Rockaway Parkway in Brooklyn to 8th Avenue on Manhattan. Announce­ments of stations and connecting lines. Nice landscape details outdoors. The creators of the line have made an effort to get the signals and signal aspects to look like they do in real life. Few details at stations. The timetables show the same departure and arrival time for all route alternatives, not considering the time of day stated. The 2 evening alternatives to Bedford Avenue and Lorimer Street actually go to 8th Avenue as the 3 other alternatives. This is an update of the NYCTA L line. 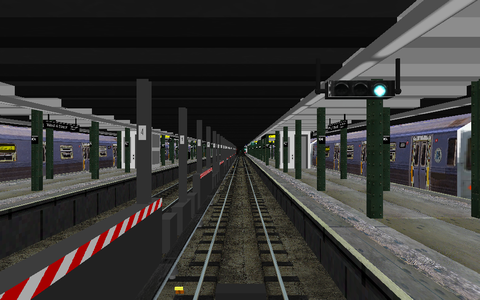 The main updates are a change of a lot of textures and that the light signals have been changed to look like real NYC subway light signals. Line M in New York's subway (the remaining part of the Myrtle Avenue line, part of the Jamaica line, then via the Williamsburg bridge to Manhattan and the Nassau Street line, all former BMT). The M line begins at Middle Village - Astoria Avenue in Queens and goes via Brooklyn to Broad Street in lower Manhattan. Then the train is moved, out of revenue service, to a layup track beyond the last station. The team behind this route provides a well-done and beautiful simulation of the highest class. 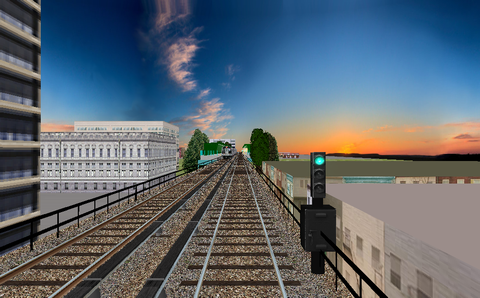 Stations, trackside objects and the urban environment is detailed. Soft curves and realistic switches, announcement of stations and connections. Different alternatives for the whole or parts of the line at various times of day. This line comes in a bundle with the J line and the Z line. For downloads, se the J line. Line N in New York's subway (the Astoria line, part of the Broadway line part of the 4th Avenue line, Manhattan Bridge and the Sea Beach line, all former BMT). The line starts at Astoria/­Ditmars Boulevard in Queens and goes via Manhattan to Bay 50th Street in Brooklyn. There are no less than 27 (!) alternatives for this line. The creators of this route have made a simulation of very high class. A lot of details trackside and in the urban environment, soft curves and realistic switches. 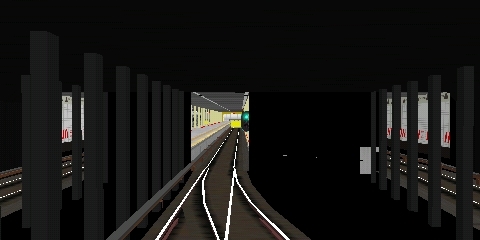 A few switches are shown in another position than the train goes. Everything on the Astoria line. Everything on the Sea Beach line. With this route are also bundled a few line M and line W alternatives, and also a garbage train's route through the subway system. 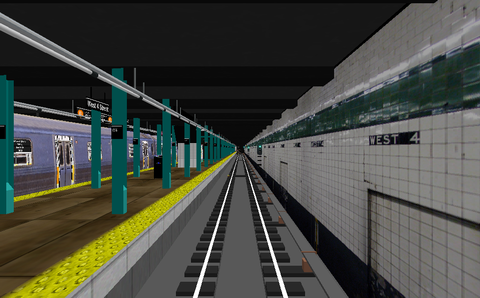 A shuttle line that is a part of line R in New York's subway (the 4th Avenue line former BMT), for the class R-46 subway train. This shuttle part of line R starts at Bay Ridge/­95th Street in Brooklyn and goes to the station at 36th Street in Brooklyn and a reverse track beyond that station. Trackside details, realistic signal aspects, soft curves and realistic switches. Line S - Franklin Avenue Shuttle (line sign S is used by all shuttle lines) in New York's subway (former BMT).This partially single track shuttle line from Franklin Avenue to Prospect Park in Brooklyn has 4 stations. This is entirely a surface line. The lack of landscape details has in the southbound alternative been compensated by fog limiting the viewing distance. Line V in New York's subway (part of the 6th Avenue line, part of the Queens Boulevard linen, both former IND). The line begins at Lower Eastside/­2nd Avenue on Manhattan and goes to Forest Hills/71st Avenue in Queens and a reverse track beyond that station. The holiday alternative for the old R-1 train is shorter and stops at Queens Plaza in Queens. 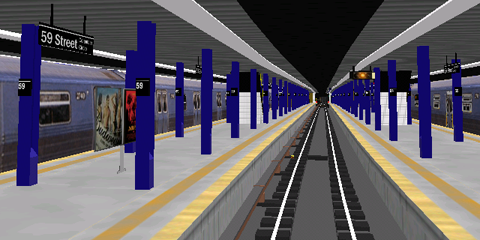 The creators of this route have made a simulation of high class. A lot of details trackside, soft curves and realistic switches. Line Z in New York's subway (a small part of the Queens Boulevard Line, former IND, the Jamaica line, then via the Williamsburg bridge to Manhattan and the Nassau Street line, those later all former BMT). 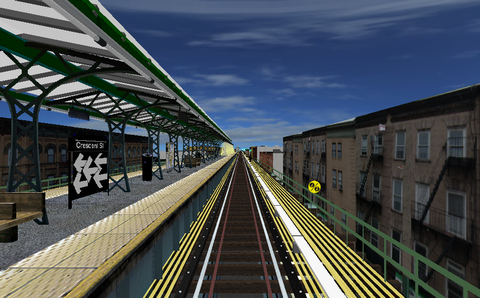 This Z line simulation begins at a lay-up track beyond Jamaica Center - Parsons/Archer in Queens, starts revenue service at that station, and goes via Brooklyn to Broad Street at lower Manhattan. Then the train is moved, out of revenue service, to a layup track beyond the last station. The team behind this route provides a well-done and beautiful simulation of the highest class. Stations, trackside objects and the urban environment is detailed. Soft curves and realistic switches, announcement of stations and connections. Different alternatives for the whole or parts of the line at various times of day.